International Advertising Law gives an overview about the legal situations of advertising law in many countries across the globe. Recent political and technological developments and globalization have integrated national markets, making borders less and less relevant to marketers who are becoming as interested in selling to customers outside their own countries as within. Most cross-border advertising occurs uncontroversially. However, as international advertising activity falls under so many diverse areas of law (soft IP area, including trademark and copyright law), some familiarity with the dense web of legislation, regulation, and case law is essential for all advertisers. This well-known book, now in a fully updated third edition, meets the practical needs of corporate counsel engaged in multinational marketing and provides all the necessary information in an easy-to-use country-by-country format. when a statement may be deemed ‘misleading’. 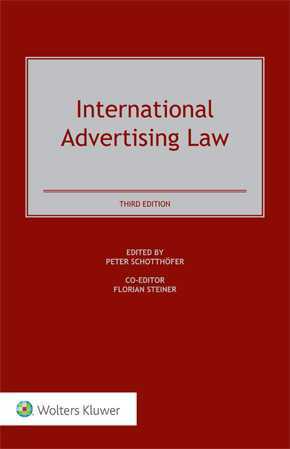 This book describes basically the legal situation in an understandable and reasonable way in order to help gain insight into relevant information for international advertising and marketing campaigns. Because the freedom to market a product simultaneously in several countries is a significant economic benefit, the invaluable information and guidance in this book on what is legally possible in a broad range of countries is of humongous help to firms in all fields that engage in the sale and marketing of products or services. Corporate counsel and marketing directors will definitely find this new edition of a proven handbook resourceful.